You are here: Home › Cover Crop Benefits › Higher Yields › Planting Radish with Wheat › Types of Cover Crops › Radishes › Planting cover crop radishes with wheat? How do you plant them? Cover crop radishes planted with wheat at seeding time? Last year I posted about how farmers in NW Ohio are seeing increases in wheat yields by 4-7 bu/acre by planting 2-4# of cover crop radishes in with their wheat seed. In the fall of 2010 there were more acres of wheat planted in Indiana, Ohio and lower Michigan than in many years before, and several of those acres had radishes planted with them with the hope of increasing yields. Several test plots were planted as well. Unfortunately, the seed was planted into very dry soil and it did not rain until late October or early November so the radishes grew very little (if at all). So the grand “radish seed planted in with the wheat seed” experiment was pretty much a flop in 2010 in the eastern Corn Belt. However, I heard reports from Oklahoma and New York that claimed to see value in this practice. By the way, 2# per acre is plenty. 4#/acre is too much seed. I first mention the “coffee can and paddle” approach of adding the seed. As you fill the drill add some radishes and use a paddle (or even a tree limb) to stir it in. With that approach I usually get a confused and almost angry look from producers that think I am mocking them (Seriously, I am not!). Since most farmers are more sophisticated than that I recommend adding the radish seed to the wheat seed at the seed house. Then I get angry calls from the wheat seed suppliers about adding a “weed seed” into their bagging system! So I have concluded that the easiest way (and the way to recommend that will not get me in hot water) is to add the radish seed with the fertilizer that will be applied just before or after the wheat is planted. I’m open to suggestions. If any of you do this differently will you please help out our fellow wheat producers? Thanks! These radishes are about the size we should expect to see when the season ends if planted with wheat. These radishes show the potential growth in just over 6 weeks since planting..
25 Responses to Planting cover crop radishes with wheat? How do you plant them? I was curious as to how the radishes were helping yield for the winter wheat. Do the radishes grow more vigorously after planting and scavenge nitrogen deeper down in the profile and then when the radishes die, the N is mineralized back so the wheat can use it? So i was also wondering then if that is how the radish helps the wheat, is the N that the radish picks up the N from the nitrogen fertilizer applied just before planting? This is a very interesting concept about the radish increasing wheat yields. This really got my attention and so I thought i would ask about it. The radishes use the N that is applied before planting and they also scavenge N from the soil. Oftentimes wheat is planted after soybeans and there is plenty of N available for the radishes to scavenge in the soil produced by the soybeans! Basically the radishes are capturing and recycling N for the subsequent crop! It’s a pretty cool concept isn’t it!?! So in a unusually wet fall situation, the radishes could potentially take up nitrate that could possibly be leached and then hold onto the nitrate until it dies. the nitrate would then be released to the wheat crop? Yea the concept is definitely cool beans! Do you have any knowledge of producers using this technique in West KY or southern IL? I don’t know…but I will ask some Amish friends in the Elkton, KY area if they know of anyone doing it. I know they are using quite a few cover crop radishes in the area. All of the literature is saying the cutoff date for radishes is either 8/31 or 9/10. Our fly-free date is 9/23 and our official first-frost date is roughly Oct 15. I know the first frost won’t kill the radish, so likely a killing freeze won’t happen until mid-to-late November. If we plant on 9/23, how significant is the risk that we won’t get good radish growth before the winter kill? Is it just a weather crap-shoot? The recommended planting depth for radishes is .25-.5 inches. Wheat is more like 1″. We plan to no-till drill both simultaneously using the small seed box for the radish seed. So, we have to pick just one planting depth to use – do we error shallow to accommodate the radish or error deep to accommodate the wheat? Hey Eric J. When planting radish with the wheat you are not looking for “big” growth. If you get “pencil-sized” radishes you will most likely have 12-14″ deep roots (maybe deeper) and pretty good N holding going on. Seeing that you may have 5-6 weeks of growth you may well get 1″+ diameter and probably 20+ inch deep roots. That sized radish will do a good amount of scavenging of N from the soybean crop and also get through the compaction zone quite nicely. Several folks plant the wheat and radish in the same box at 1-1 1/2″ deep and see great results. If it is easier to plant the radish in the small seed box then 1/2″ is great! I’d recommend 2#/acre maximum seeding rate. I’ve heard guys in your area saying 4#/acre but we do NOT want the radish to compete with the wheat; we want it to compliment the wheat to give a greater opportunity for higher yields. Hopefully we get rain this Labor Day weekend. not sure what kind of drill you have but our great plains drill seeds at two differnt depths. we planted sun hemp in fornt hopper at 1 inch deep and tillage radish at 1/2 inch deep last fall. seed from small seed hopper falls just in front of press wheel. planted in alternating rows. plan to plant wheat and radish together this year around last of november. Where are you from that you can plant the radish and wheat that late? BTW, thanks for the heads up on how you did the sunn hemp and radish last year! north florida. the bottom of the soft winter wheat belt. I appreciate the feedback – it gives me more confidence that I’m doing the right thing. I really appreciate hearing what I should look for to consider this crop a success. I have a John Deere 750 no-till drill – both seed boxes feed the each shoe so I only get one depth. I plan on doing 2#/acre, likely also trying out Tillage and GroundHog brands if I can get my hands on both. Interesting to hear about planting to 1.5″ deep – I’m a bit skeptical going so deep, but at the end of the day, it will probably boil down to balancing hitting moisture (deeper) and without emergence-stifling seed cover. Just to double check – even though 2#/acre is just 25% of a pure stand seeding rate, you’re saying that putting the wheat and radish in the same furrow does not result in radish foliage crowding out the wheat seedlings? Do I use a normal wheat seeding rate or do I bump it up slightly? We got .25″ overnight and it looks like it could rain anytime – at least the pastures appreciate it! Eastern Kansas. We want to plant 2 lbs of soil buster radishs with wheat. Using a JD 1690 drill. How do we plant 90 lbs of wheat and only 2 lbs of radish with one box? Hi Scott. There are a number of ways to accomplish this. The easiest way is to mix the seed in a seed mixer then put it into a wagon and then meter it into your drill. Another “old fashioned” way is to mix the seed in the seed-box. Add wheat, then add some radishes and mix the two together, add more wheat then more radishes and mix that together…this is a bit slower and not as “exact” on the mixing, but it will work. Many folks are taking the seed to a fertilizer company and mixing all of the seed together with fertilizer then broadcasting the seed and fertilizer on. One thing to remember is that the radishes do not need to be perfectly placed. 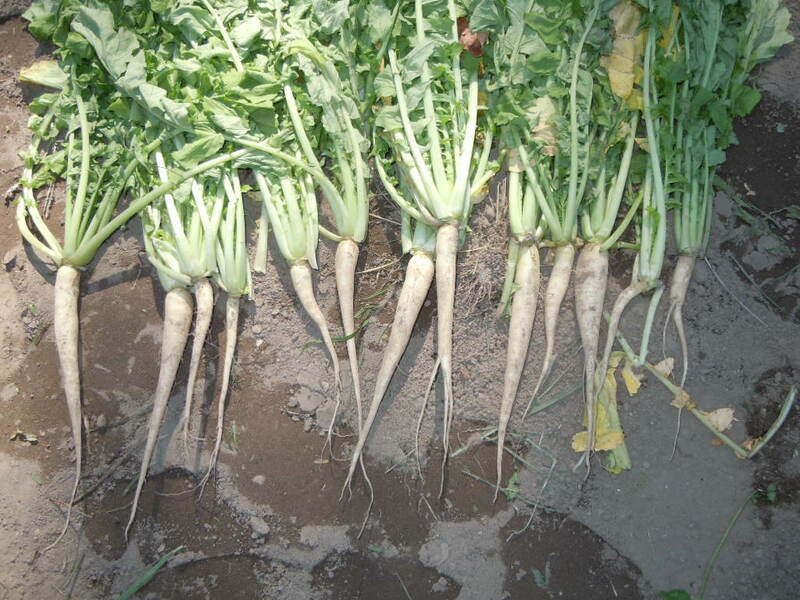 While it would be ideal to have 1 radish every 8″-10″ per row, that is not likely to happen regardless of how you do it. If you had a small seed box that would be the best way to place the radish most “perfectly”. Wondered if radishes in spring wheat was an option or would they be too much competition with season long growth? Would like to hear of other companion cropping systems people are trying. I am a no-till farmer in east central SD. Jeremy, No you should NOT plant radishes with spring wheat. The radishes will produce seed with a spring planting and also be very competitive against the wheat. The reason they work in the fall is that they grow more slowly and also that they die over the winter in most areas. If a fall radish does not die over the winter it will try to produce seed early in the spring…and thus need to be sprayed out in the early spring. In South Dakota they will most assuredly die over the winter. In spring wheat I am not aware of any companions that would work. Why couldn’t the radish go in the grass seed/clover hopper? I have found that I get a nice stand of radish with my old Massey Harris grain drill by putting them in the clover hopper and keeping it wide open. Lower settings don’t put out enough seed, but then again, I am sowing only radish at about 8-10 lbs/acre. Mike, You sure can do that. However, many folks don’t have that box on their drill. If someone does it is by far the best way to plant the radishes with the wheat. my Great Plains has a small seeds box with seed-loc wheels. I plant wheat 1-1.5″ deep. the seed-loc wheels cover that seed with a half inch of soil and firm the wheat seed in the bottom of the seed trench. the radish and/or turnip seed is placed behind the seed-loc wheel at a depth of .5-1″ (on top of firm soil) and the press wheel follows behind. I have also used deverter tubes to plant between the rows; however, I needed to used much higher seeding rates because the soil isn’t packed as effectively as the press wheel (I use a harrow behind the drill in this instance). conversely, planting into ideal seeding conditions, and at the proper depth, results in the need to cut the seeding rate down to 1 lb or less. the radish seed is very small and most of it is wasted planting it as deep as wheat is planted. To those of you who have a John Deere 750 drill, or a newer version thereof, Eric J presents an interesting dilemma: When planting a seed mixture in which differing planting depths are preferred, which of the seeds within the mixture do choose to plant at the wrong depth? The JD 750 drills (and newer), if equipped with a grass seed attachment, show in the owners manual that the seed tubes for the grass seed are designed to be routed and fed into the main seed tubes – a wonderfully simple engineering approach to putting all the seeds in the ground, but quite wrong for establishing distinctly different seeding depths for different sized seeds. We have taken the approach that Joel L mentions above, wherein we have equipped our grass seed attachment on our JD 1560 drill with longer seed tubes that simply drop the small seeds directly on the ground in front of the depth guage wheels (no press wheels on these drills), which merely roll the seed into the top of the soil. This method has worked quite well for us when seeding oats and alfalfa together in the spring in southern Minnesota. However, we have not yet tried this method without first lightly tilling the soil. We did some strips with radish plus wheat last fall and didn’t see any difference at harvest when we compared them to strips with just wheat (no radish). 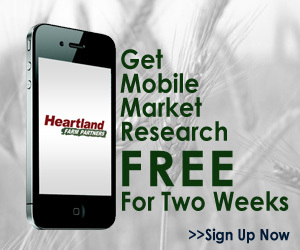 Is there any research to show the yield advantage or is it just anecdotal evidence? Good question! Michigan State University ran some tests on farms in the Thumb of Michigan in 2014 and found 2-4 bushel/acre increase with radish vs. without. However, in Door County, WI the yield was reduced by 2-3 bushels/acre in 2013. I believe much more research needs to be done about timing of planting of the wheat + radish. I think that is the biggest reason for success vs. less than success.